ProDoc Digital Stadiometer BUY Detecto Stadiometer, Digital Stadiometer, Stadiometer Standalone Wall Mount Stadiometer, Stadiometer with Height Rod, DHRWM, ProDoc Stadiometer, Digital Height Measuring. 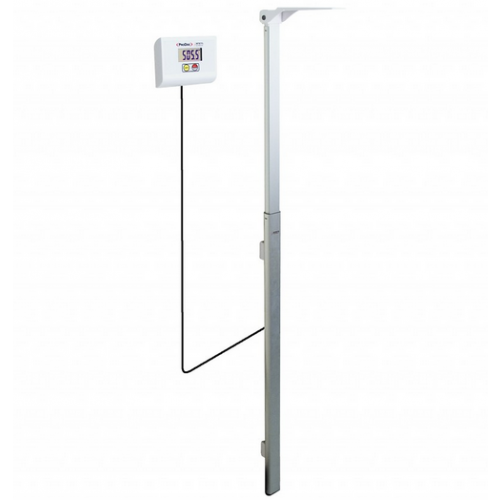 ProDoc Digital Stadiometer is a standalone wall mounted Height Scale Digital Height Rod that provides height readings quickly, accurately and comfortably. A digital display provides the height measurement and can be mounted to an adjacent wall or desk for ease of use. A 69 inch length cable connects the Stadiometer to the digital display. The ProDoc Stadiometer measures up to 6 feet, 7 inches. The ProDoc Stadiometer is manufactured by Detecto. Detecto ProDoc Digital Stadiometer Product Number: DHRWM. Battery operated (6 AA Alkaline batteries not included). Detecto ProDoc Digital Stadiometer Owners Manual. This unit is made with inexpensive materials and will no doubt not hold up to intensive usage. Very difficult to install. When the installation instructions used 25/64" I knew that someone with no experience in the field was involved.